Recently, Jackson has been very interested in playing doctor. He asks if anything hurts and then proceeds to fix us, so I bought him a doctor kit. Today when we gave it to him, he put the stethoscope on and held it to Ross' chest. Ross asked, "What do you hear?" Jackson replied, "I hear God talking!" If you haven't guessed, when Jackson has asked us where God is, we've told him God is everywhere and lives in our hearts. I guess he understood the concept! Audrey had a first today. She's been asking to sit on the potty lately, and today she actually went! I think we still have a long way to go before we'll be ready to truly potty train, but I love the idea of being done with diapers soon! Ross has been gone on travel all week for work, so today I got a little break. 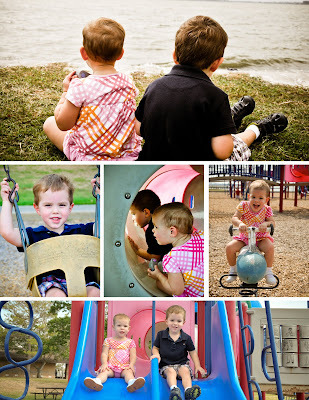 While I went to a party at my friend, Melissa's house, Ross took the kiddos to the park. They had a great time as you can see, and there are more pictures in the album! We rounded out the afternoon with a little down time at home that included a hair cut for Jackson, and then met up with our friends, Jennifer, Scott, and Sydney, for dinner at Lupe. It was a great day! I totally shared the Jackson-stethoscope story with someone today. Just thought it was so cute...and a great illustration of how much kids absorb. Love it! Audrey is 18 Months Old!